HTML5: A blessing or a curse? Initially heralded as the future of browser gaming and the next step beyond the monopolised world of Flash, HTML5 has since faced criticism for being tough to code with and possessing a string of broken features. The coding platform, the fifth iteration of the HTML standard, was supposed to be a one stop shop for developers looking to create and distribute their game to a multitude of platforms and browsers, but things haven’t been plain sailing. And whilst this has worked to a certain degree, and a number of companies such as Microsoft, Apple, Google and Mozilla under the W3C have collaborated to bring together a single open standard, the problems it possesses cannot be ignored. Adobe Systems has dipped its toes in the HTML5 pool, but starting today it's taking the plunge with the public preview release of software called Edge. For years, the company's answer to doing fancy things on the Web was Flash Player, a browser plug-in installed nearly universally on computers for its ability to play animated games, stream video, and level the differences among browsers. Notably, these new standards worked on new smartphones when Flash either wasn't available, ran sluggishly, or was barred outright in the case of iPhones and iPads. Adobe is working hard to keep Flash relevant for three big areas--gaming, advanced online video, and business apps--but with Edge, it's got a better answer to critics who say Adobe is living in the past. "What we've seen happening is HTML is getting much richer. We're seeing more workflow previously reserved for Flash being done with Web standards," said Devin Fernandez, product manager of Adobe's Web Pro group. A look at the Adobe Edge interface. It all can be done today with programming experience, but Adobe aims to make it easier for the design crowd used to controlling how events take place by using a timeline that triggers various actions. 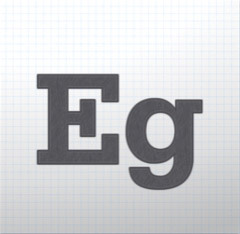 As new versions arrive, more features will be added, and Adobe plans to begin selling the finished version of Edge in 2012. "[For] the first public preview release, we focused on animation," Fernandez said. 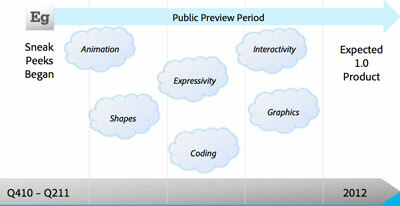 "Over the public preview period, we'll be adding additional functionality. We'll be incorporating feedback from the community, taking those requests into account." The Edge preview product now is available at the Adobe Labs site. Adobe showed an early look at Edge in June. What exactly is next in the pipeline? Adobe has a number of features in mind, including the addition of video and audio elements alongside the SVG, PNG, GIF, and JPEG graphics it can handle now. • More shapes than just rectangles and rounded-corner rectangles. • Actions that are triggered by events. "We still have a lot of features we have not implemented," said Mark Anders, an Adobe fellow working on Edge. The software integrates with Dreamweaver, Adobe's Web design software package, or other Web tools. It integrates its actions with the Web page so that Edge designers can marry their additions with the other programming work. The software itself has a WebKit-based browser whose window is prominent in the center of the user interface. A timeline below lets designers set events, copy and paste effects to different objects, and make other scheduling changes. Adobe, probably not happy with being a punching bag for Apple fans who disliked Flash, seems eager to be able to show off Edge to counter critics' complaints. The company will have to overcome skepticism and educate the market that it's serious, but real software beats keynote comments any day. Anders, who before Edge worked on Flash programming tools and led work on Microsoft's .Net Framework, is embracing the new ethos. "In the the last 15 years, if you looked at a Web page and saw this, you would say that is Flash because Flash is the only thing that can do that. That is not true today," Anders said. "You can use HTML and the new capabilities of CSS to do this really amazing stuff." HTML5 is a hot topic, which is a good thing. The problem is that 99% of what’s been written has been about HTML5 replacing Flash. Why is that a problem? Because not only is it irrelevant, but also it prevents you from seeing the big picture about interoperability. Flash as been around for more than 12 years. It is a de facto standard for the publishing industry. (No Flash = no advanced features in banners). HTML5 does not officially exist (yet). Rather, it’s a specification in working draft, scheduled for publication in 2014. The video element in HTML5 is perfect for basic video players, but Flash and Silverlight are much more suitable for advanced video feature (streaming, caption, interactive features and miscellaneous video effects). These are not interpretations or opinions. These are facts. The truth is writing about the agony of Flash is an easy way to draw readers, a much easier way than to adopt a nuanced stance. And this is why we read so many garbage about HTML5 vs. Flash. (For an accurate description, please read HTML5 fundamentals). All this said, HTML5 will indeed replace Flash in certain circumstances, specifically Light interface enhancements. To explain this, we must go back in time: HTML’s specifications evolved over 10 years, thus web developers wishing to offer an enhanced experience had no choice but Flash. 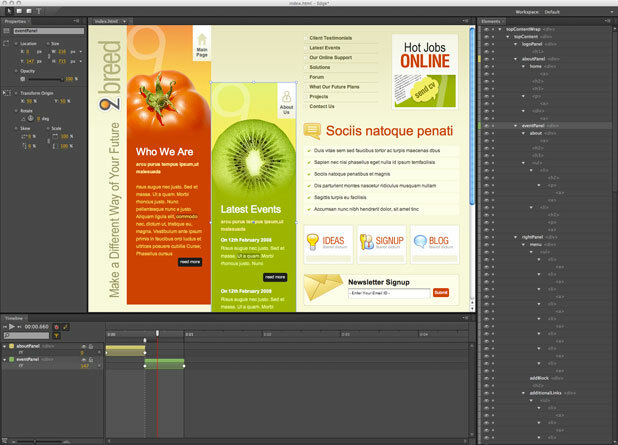 In recent years, we began to see Flash used for custom fonts and transitions. But HTML has at last evolved into HTML5 (and CSS3), which allow web designers to use custom fonts, gradients, rounded corners and transitions, among other uses. So in this particular case (light interface enhancements), Flash is rapidly losing ground to a much more legitimate HTML5. So if HTML5 is more suitable for light interface enhancements, this leaves rooms for Flash to do what it does best: heavy interface enhancements, vector-based animations, advanced video and audio features, and immersive environments. To make a long story short: Flash has a 10 years advance over HTML. This technology isn’t better but because it’s owned by a single company has the entire control on its innovation rate. I have no doubt that one day HTML will have the same capabilities as Flash today, but in how many years? Don’t mistake me. Not every site needs Flash or an equivalent RIA technology: Amazon, Ebay and Wikipedia built their audiences with classic HTML, as did millions of web sites. So for the sake of precision: I am not an Adobe ambassador nor I am a web standards’ ayatollah. I am just a web enthusiast enjoying what the web best has to offer, whether powered by standard or proprietary technologies. Moreover, standardization is not a simple process, because what we refer to as standards (from MP3 and JPEG to h.264) are in fact technologies owned by private companies or consortiums. Then, there is the mobile argument. If iOS and Android provide users with an HTML5 compliant browser, what about Blackberry? Symbian? WebOS? Feature phones? Low cost tablets? If interoperability and wider reach are mandatory, then maybe the better way to achieve them will be to focus on APIs exploited by multiple interfaces, rather than on a miraculously adaptive HMTL5 front-end. Of course, there are many technical arguments for one technology over the other. But the best and most important part is that you don’t have to choose between HTML5 and Flash because you can use both. Maybe the best answer is to acknowledge that HTML5 and Flash have their pros and cons and that you can use one or the other or both depending on the experience you wish to provide, your ROI and SEO constraints, and the human resources you access. In short, it’s not a zero sum game. Rather, it’s a process of natural evolution, where HTML is catching up while Flash is focusing on advanced features (and narrowing, even as it consolidates, its market share). Both are complementary. So please, stop comparing.